Before beginning, I would like to acknowledge the pioneering work on this approach done by the VanDusen Botanical Gardens. It was work at VanDusen and resources supported there that initially showed this approach to have promise. Here I would like to give a shout-out to VanDusen for their efforts. I would also like to note that the work directed by myself was funded through the BC Inter-Ministry Invasive Species Working Group (IMISWG), the BC Ministry of Transportation (MOT) and BC Ministry of the Environment (MOE). There is still a long way to go with respect to a treatment for European fire ants that is simple and effective. The approach noted below appears to be effective but requires some effort. An outline of the approach can be found in the video below. NOTE: Before beginning treatment, please ensure that you are actually dealing with European fire ants. An identification is necessary as there is seldom a need to deal with native ant species if they are outdoors. Native ant species have positive ecological impacts (e.g., they will remove defoliating insects from shrubs and trees) and may act to block (at least initially) invasive ants from moving onto your property. Information about collecting ants and getting an identification can be found by clicking here. There are two primary steps that you need to follow. The First Step: Finding the nests. Unlike the red imported fire ant (Solenopsis invicta) known in the American south, the European fire ant (Myrmica rubra) has no visible mound. 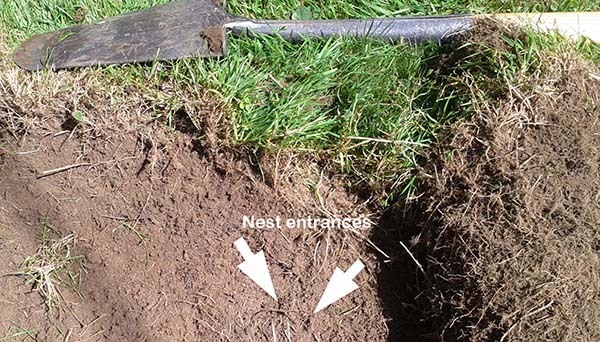 Unfortunately you only find the nests when you step on the entrance which is usually only a small hole (see Figure 1) hidden by vegetation. Figure 1. Entrances to a European fire ant colony. Grass has been pulled back to expose the entrances. Image: R. Higgins. 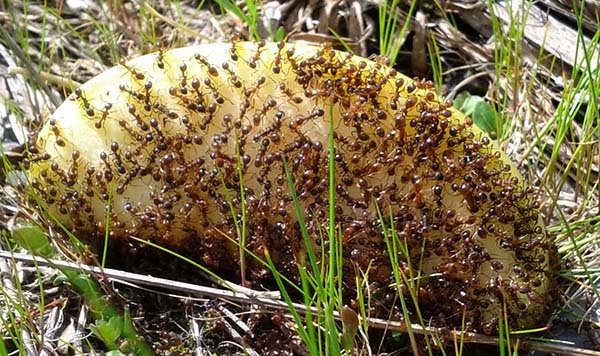 European fire ants, however, mostly forage within a metre or so of their nest and are attracted to apple. Laying out a grid of apple slices on a property (see Figure 2) when air temps are above 15 but below 25 for about 90 minutes, will usually tell you where the nests are roughly located. European fire ants will cluster heavily upon the apple (Figure 3) when it is close to a nest (usually within a metre or less). Figure 2. Simple grid placement of apple slices around a property. Spacing is between apple slices is approximately 2 metres. Image: Modified by R. Higgins from Google Earth. Figure 3. European fire ants clustering on an apple slice. This apple slice is likely well within a metre of the nest. When high numbers of European fire ants have been found on an apple slice, use a 3 prong gardening tool to disturb the local area. The ants will respond to this disturbance by swarming out of their nest (see video above). Use some object or small spike to mark the location of the nest. An additional complication is that a nest may have lateral tunnels that connect to an adjacent entrance (Figure 4). When the nest is physically disturbed (e.g., a shovel beginning to dig it out), some of the queens will likely escape into these tunnels. This may be why heat treatments (e.g., boiling water, steam, burning, freezing) of colony soil have been ineffective. While many ants are killed, the queens move back into the treated soil (or soil near adjacent entrances) and rapidly rebuild the colony. Figure 4. A wax cast of a European fire ant nest. Nest entrances are about 80 cm (two and a half feet) apart here. Image: S. McCann. Thus, following the treatment noted below, it is necessary to explore the adjacent area and also treat these entrances. The approach recommended here involves the use of 0.25% permethrin. Please follow label directions and note any local bylaws relating to pesticide use. Permethrin is a synthetic pesticide modelled upon pryethrins found in crysthanamum flowers. It has low mammalian toxicity although it is toxic to fish limiting its use around fish bearing waters. Cats are also more sensitive to this substance (please read the label). Once a nest has been identified you want to dig out about 10 litres of the colony soil. This volume is easily estimated by filling half an 18-20 litre bucket (Figure 5). Figure 5. 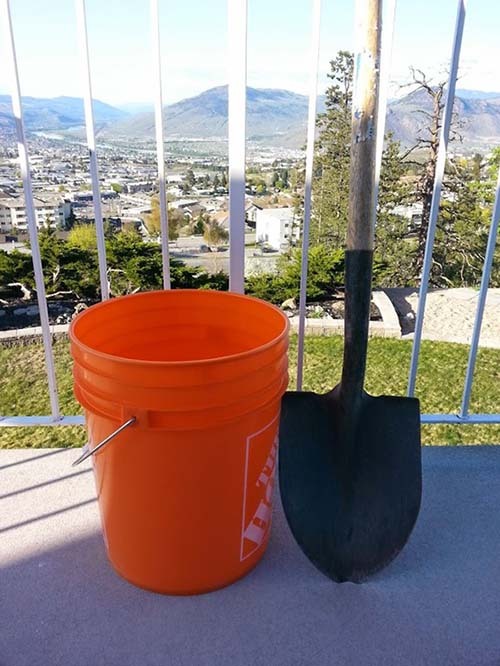 An 18 litre bucket and shovel. Your primary treatment tools. Image: R. Higgins. Now spray that soil with a 0.25% permethrin solution while overturning the soil in the bucket to facilitate mixing. Products containing this pesticide at this concentration can normally be found at hardware stores. 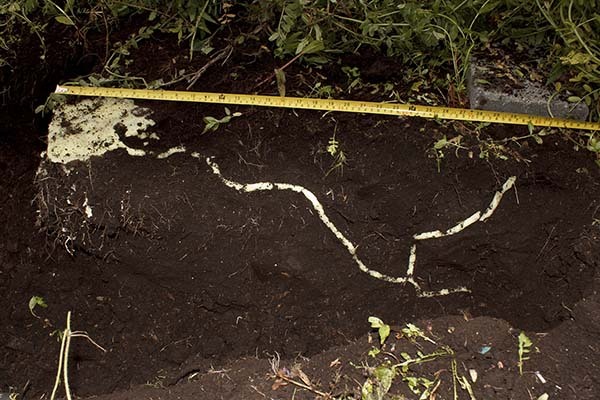 Ten litres of soil will take about 180-200 ml of the 0.25% permethrin. You can now pour the soil back into the hole you have created. You will likely have missed many of the queens in the colony, but if you have found the surrounding entrances (ants will also swarm from these if they are disturbed using a 3 prong gardening tool), they will be trapped in the tunnels and unable to move out without coming in contact with treated soil. Continue this process until you have found and destroyed all of the nests on your property. For many people this may be a summer project if you are looking at 30 - 50 nests (not unusual for some residential properties). One property owner in Victoria eradicated about 35 nests in the summer of 2015 and was comfortable that the property was fire ant free at the end of the process. 1. European fire ants (and ants generally) love to live beneath stones (e.g., paving stones, stone borders) and if European fire ants are living within tree roots you might be able to lure the colony away from the challenging site by laying out some small pavers nearby (in direct sunlight). Pavers heat up by the sun during the day and stay warmer than the soil at night making them ideal for ants. Pavers are most attractive in the spring when the ants are really looking for some extra heat. 2. European fire ants also like to live in wood. Wood has similiar heat properties to stone and has the added benefit of often allowing the ants to nest directly inside. Old garden bed borders can be thriving locations for European fire ants. 3. Control will be an ongoing project. As these ants will typically spread throughout a city block through adjacent properties (they do not like to cross paved roads), you can expect colonies to reinvade the following year. Monitoring using apple slices in the spring and early summer should turn up new colonies and allow you get them under control quickly.